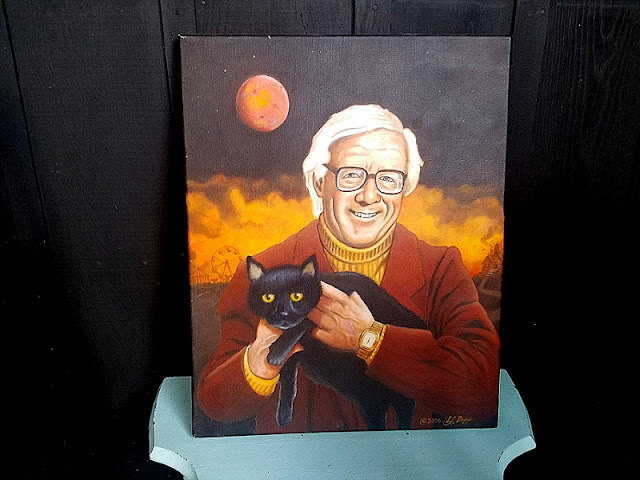 October 23, 2017 — It’s not an OTIS Halloween Season Blog unless Ray Bradbury makes an appearance. Unfortunately, I’m not going to be able to top last year, where I was able to dedicate an entire week of articles and videos to him after visiting his hometown of Waukegan, Illinois, the inspiration for many of his best stories. I mean, I crossed the ravine from The Halloween Tree…at night. I’ll never do better than that. So instead of trying, I’m going to keep this season’s tribute to the author confined to the four walls of my study. 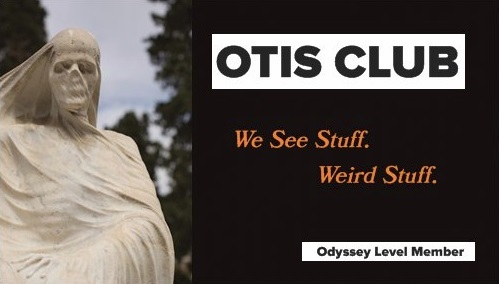 If you can’t make it to the house, I have showed some of it off here and there during the my long-running and highly irregular Strange Stuff from My Study series, which is sometimes an OTIS article, sometimes an OTIS video, and sometimes part of the OTIS Club Newsletter Thing, but which is always a tour of some of the weirdness that I cocoon myself with where I write. 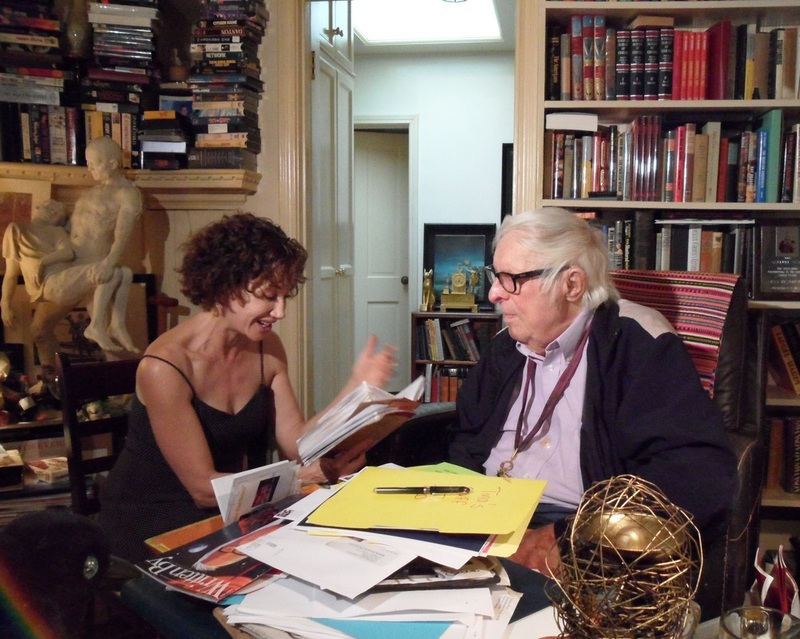 One of the habits I’ve gotten into over the years of collecting Bradbury is scrutinizing any photos I come across online of the Samhainic scribe in his house to see if I can find any of the artifacts I own in the frame. Especially if it’s a photo of his study. That awe-inspiring, messy pile of nostalgia and monsters and whimsy that he used as his own cocoon. I mean, I have valid documentation of these artifacts already, but nothing beats a photo of Ray beside something that is now beside me. So far, I’ve been lucky four times. Lemme show you. I apparently really need to dust them. 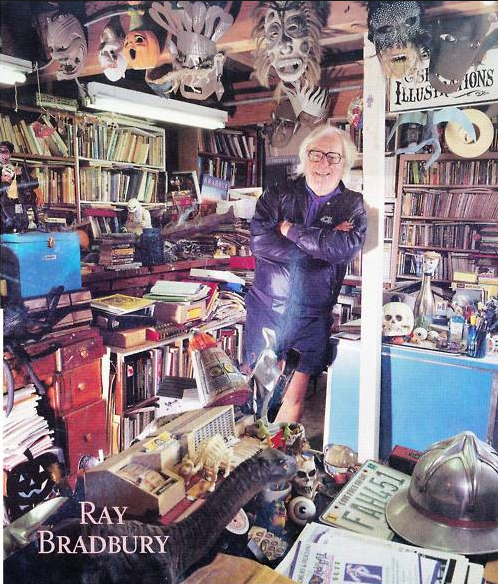 Above is a photo from Bradbury’s later years talking to author E.E. King. See that wiry, coppery mass in the lower right corner? 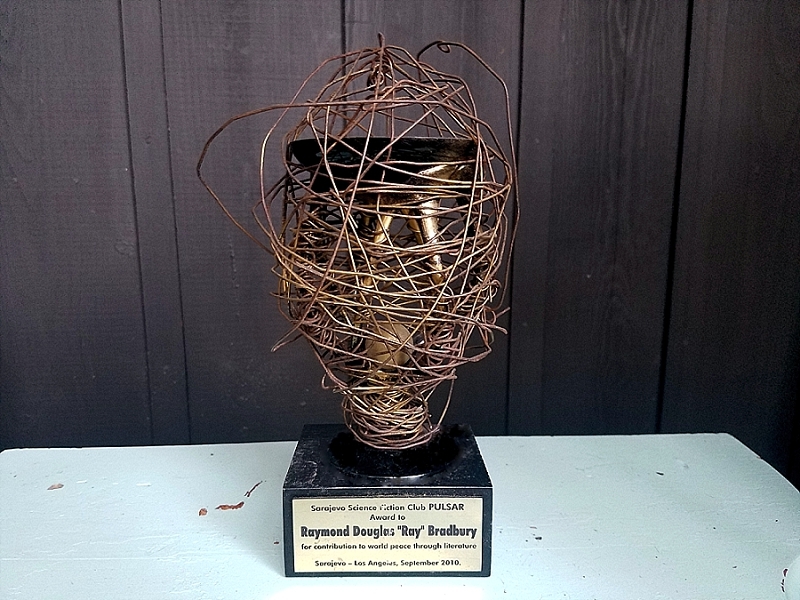 That’s actually the top of an award given to Bradbury in 2010 for “contribution to world peace through literature.” And it now sits on my shelf about a foot away from my desk, like I was the one who win it or something. 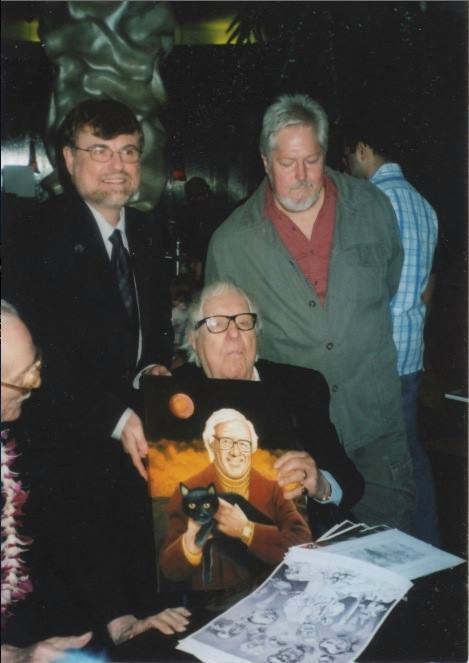 Here is a photo from 2006 of Bradbury being given a portrait by Brad Linaweaver (left, with glasses), editor of Mondo Cult magazine and the artist himself, L.J. Dopp (right, who also provided me the photo). That half a face on the far left of the photo is the inimitable Forrest J. Ackerman. 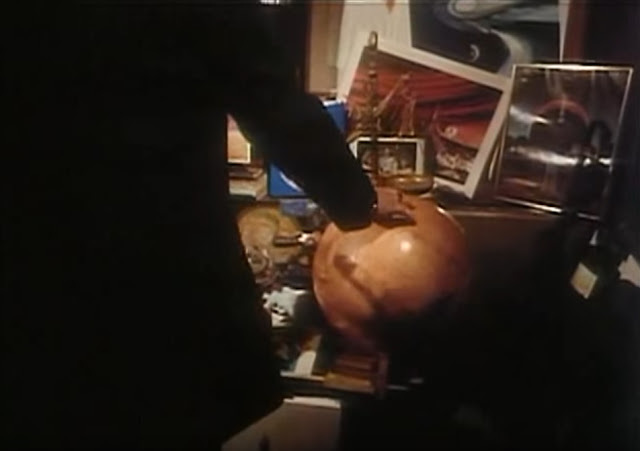 That piece of art is on that same shelf with the pulsar. Which reminds me. I need to hang it up somewhere. This is a photo of Ray in that glorious office I told you about, which seems to change in every photo like he actually writes inside a living blob of memories. This photo was pointed out to me by @AllHallowSteve, who after watching one of my Strange Things from My Study videos, noticed said strange thing in the bottom left corner. See it? That dark metal pumpkin? 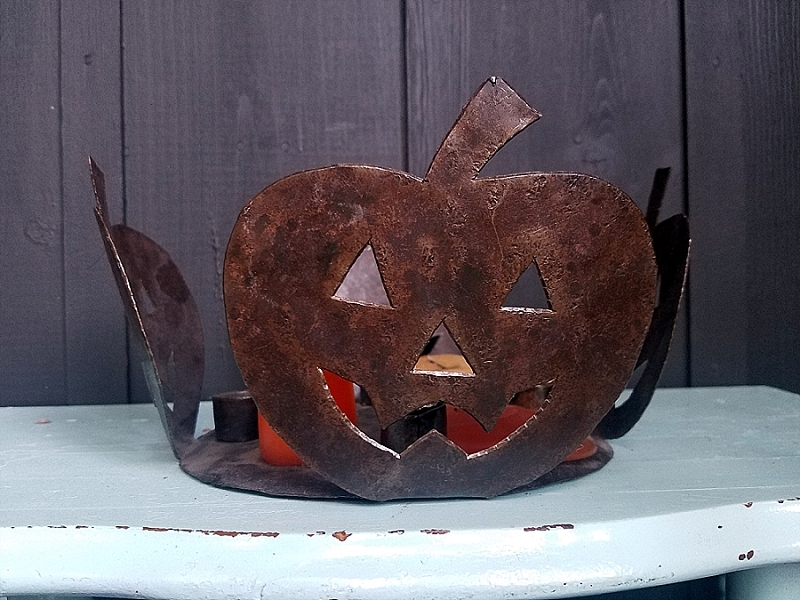 It’s part of a set of four Halloween candle holders of Bradbury’s, that I now own, complete with blobs of white and orange candles that Ray probably lit himself on Halloween nights long past. I keep one of those in my study at all times, except at Halloween, where it assumes its rightful place as a decoration again. Finally, this is an instance of me seeing something on television, knowing where it was, and going after it. This is a screengrab from The Ray Bradbury Theater, an anthology series from 1985 to 1992 that was solely based on Bradbury stories. Its intro is like my favorite piece of video in the world and I watch it over and over again when I get drunk and lonely. Also when I’m sober and surrounded by people. At one point in the show’s intro, Bradbury sweeps past a framed piece of artwork…one that currently hangs on my wall in the same frame. 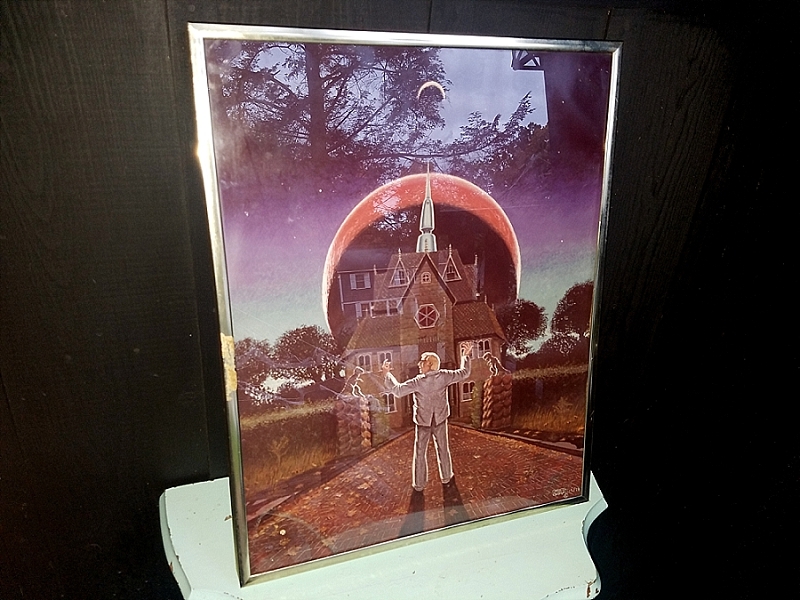 It’s a limited edition print by science fiction author Greg Bear that shows Bradbury leading a chorus of his favorite metaphors, from Mars and falling leaves to a spooky old house and dinosaurs. According to the numbering in the corner of the print, I have 12/78. But I assume only 1/1 that was in Bradbury’s television show.